One or more photo(s) has been virtually staged. LOVE THE LAKE LIFE? Then WELCOME HOME! Bring your boat then step outside your back door to go fishing, boating, tubing and water skiing! This well-maintained, two-story home is on a quiet canal that leads to the fresh water of Lake Tarpon and a day of relaxation, adventure and fun, AND it's one of the few homes in the neighborhood that also has a POOL! Once you're home from the lake, tie the boat up to your very own concrete seawall and enjoy a BBQ on the deck with the catch of the day or relax in the sunken living room in front of the wood-burning fireplace. The kitchen has a cleverly-designed pull-out table for extra counter or seating space, very useful for little ones at those big family gatherings! The kitchen also features a new stainless slide-in oven, fridge and microwave. No popcorn ceilings in this home! All three bedrooms are upstairs, with a bonus room that can be a fourth bedroom, nursery, playroom, office, game room or workout space. The master and the adjacent fourth room have a balcony that overlooks the pool, yard and water. The inside laundry has a built-in pull-down ironing board. There are two AC zones (upstairs/downstairs). The circular driveway makes parking and entertaining easy. 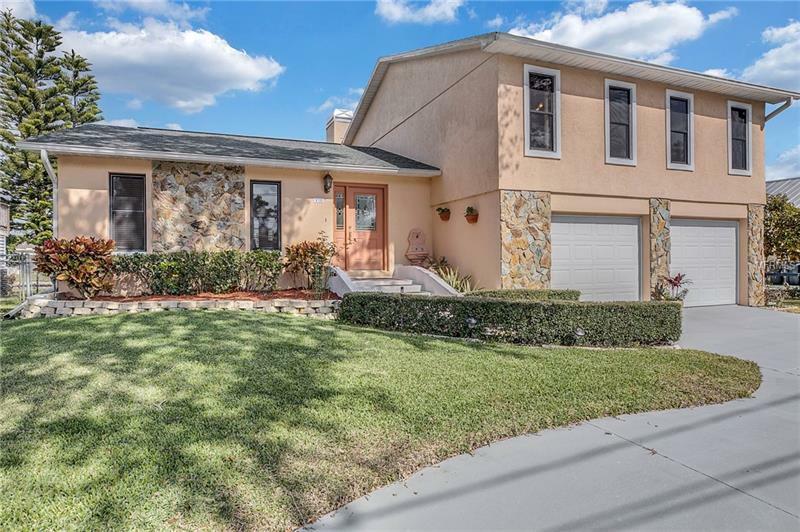 Located just off US 19, across from the Innisbrook Golf Resort, this home is close to everything yet itâs far enough away that youâll feel like youâre in your own Florida lakeside paradise. The community is having new curbs installed this winter! Home has never flooded, not even in Hurricane Irma! Additional Water Information: The owner replaced the old dock with interlocked plastic, 10' into the ground, capped by concrete.